Yields on US two-year Treasuries have continued to rise steadily to their highest level since 2008 and are now fully priced for a rate hike by the Federal Reserve in March. We are on the record for calling at least four rate hikes by the Federal Reserve this year, with the markets so far pricing in only three. 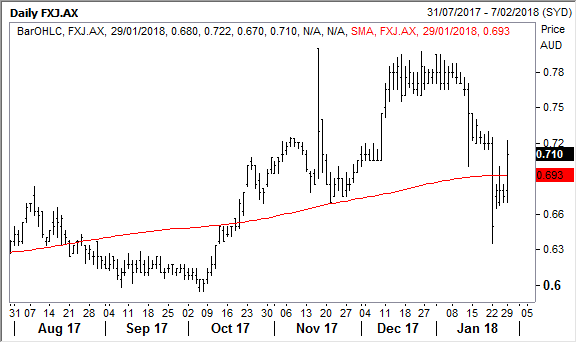 The selloff in US bonds has been broad based and ten-year yields broke above 2.6% last week to reach a high of 2.69% on Monday – for the 10 year, these levels were last seen in mid-2014. So something is definitely stirring in the bond market – our view, which we outlined in our top 10 predictions earlier this year, is that inflation is going to heat up and force the Fed to raise rates faster than the markets currently expect. I think this explains why not just US bond market yields have risen, but why the US dollar has gone down. I think US interest rates have passed a “generational inflection point”. We may not ever see the low interest rate levels of the past few years ever again. 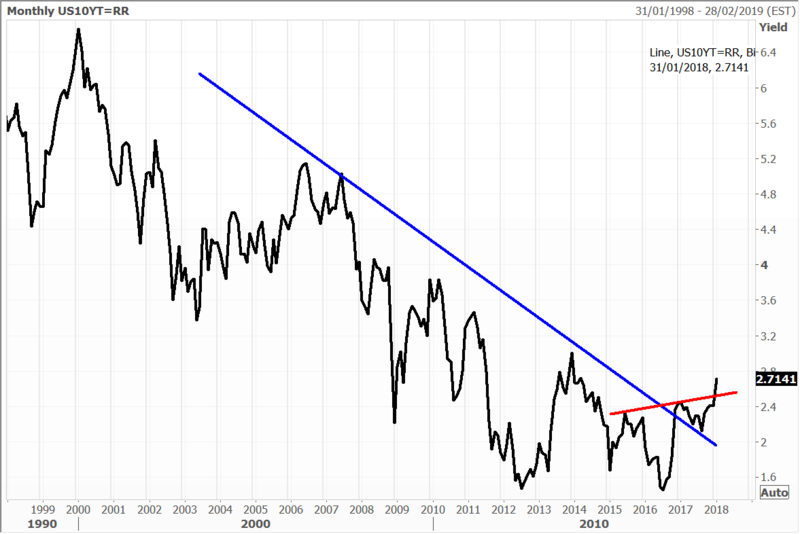 Whilst in the early stages, the yield on the 10-year US T bond is slowly but surely breaking out to the upside. The latest selloff is likely to be meet by some relief rallies, but I think it is now only a matter of months or weeks before the yield pushes decisively above 2.7%. The US bond market dwarfs the stock market and capital flows out of treasuries are probably being reallocated elsewhere – and a considerable chunk most probably offshore. The Fed holds its next meeting on Wednesday, which will be the last for Chair Janet Yellen which will only seal the case for a rate hike in March. The US dollar faces a number of key economic data points this week, including indicators of inflation, manufacturing and payrolls. 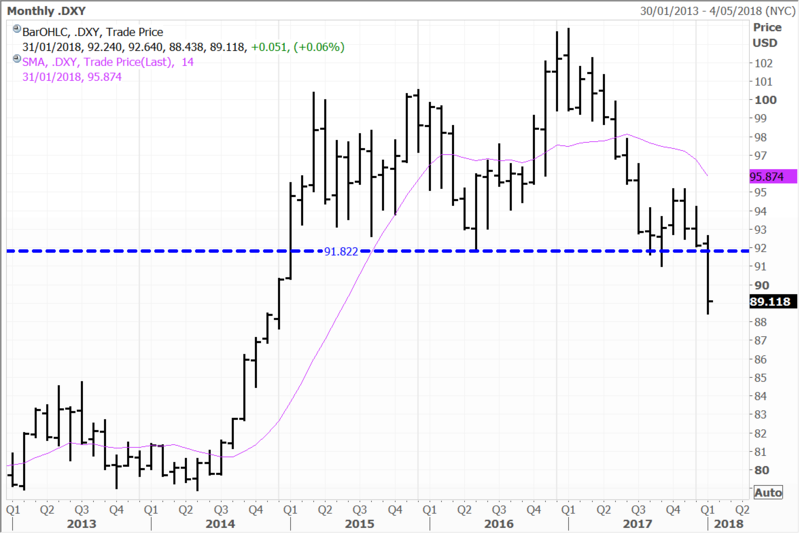 The US dollar’s decline has been a boon for many commodities, and gold has worked its way higher to a 17-month high last week at $1,360 an ounce. Gold has formed a multi-year base which is now a staging point for a key inflection reversal on a ten-year chart. All we need gold to do to complete this pattern is break through the critical $1365/$1395 resistance level. Will gold be able to break higher? I think this all comes down to just how low the US dollar will go. 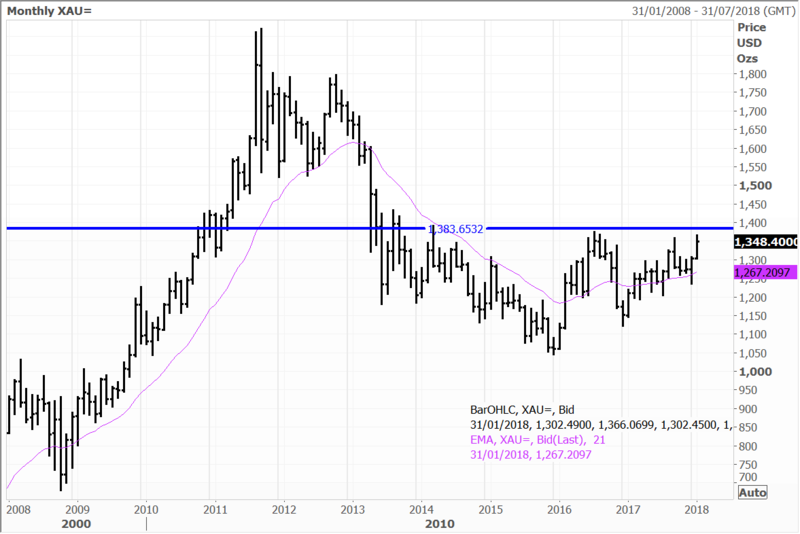 It’s not looking good for the US dollar index on the charts and the next move is probably going to be down – which could well prove good to be the breakout catalyst for gold. The US Dollar Index has broken key support – the big question now is just how low can it go? Oil prices have reached their highest level in three years with Brent crude futures holding atop US$70 a barrel while US WTI has closed the gap significantly at US$66.37. The divergence has narrowed because of ten consecutive weekly declines in American stockpiles. Although the US dollar has slipped and the rig count drilling for crude has risen in the US – it is still about 50% below the peak when oil was above US$100. So the question has to be will US production be able to rise fast enough to plug the growing demand gap? 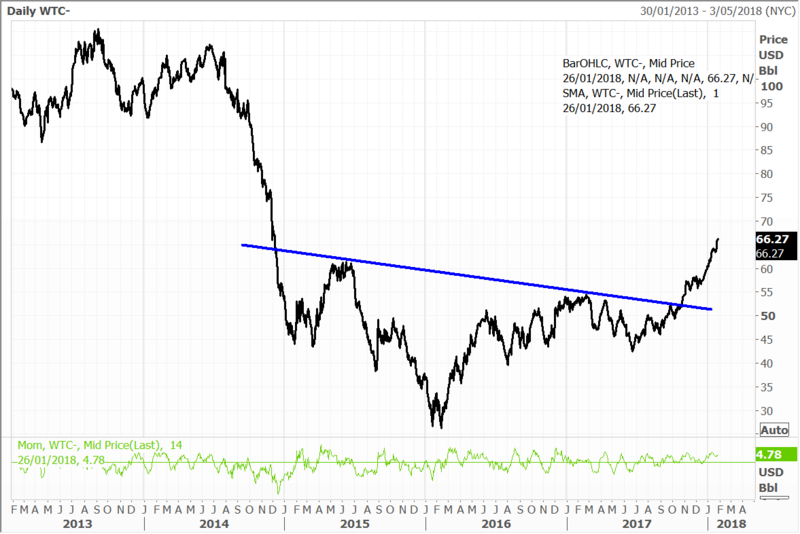 Catch me if you can – WTI Oil has definitively broken out to the upside after clearing significant resistance last year. The critical issue now is after the downward bear move in oil prices and the accompanying supply destruction – can supply catch up with record demand? South32 also had a good session, with a 3.7% gain to close at $3.97. We continue to rate the company as a high-quality play on further commodity price strength over the medium term. The shares have done incredibly well for us, and there a number of re-rating catalysts on the horizon, including the separation of the company’s South African Energy Coal business. We hold South32 in the Concentrated Australian Share, Mining & Resources, and Concentrated UK Share managed account portfolios. As noted above, we have predicted that rising inflation is going to see bond yields break higher this year, and this has important implications for a number of sectors and stocks in Australia. 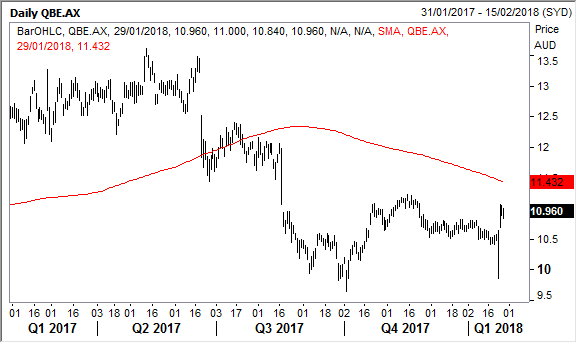 Not least of which is QBE Insurance, Rising yields are going to provide a significant boost to investment income given the insurer has a relatively low duration bond portfolio. Upward pressure on inflation is also going to underpin premium growth, and at a time when capacity has been taken out of many business lines, and particularly on the catastrophe side. 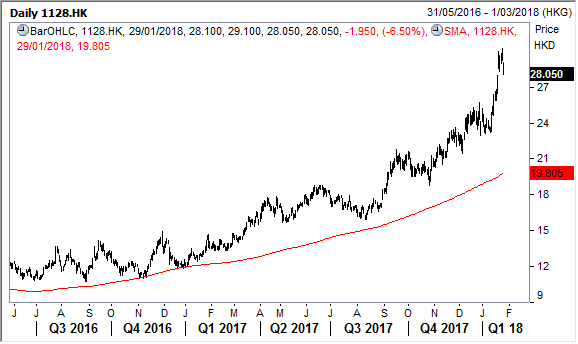 2018 therefore could be a big year for QBE with some powerful thematic tailwinds. This is also while a new CEO looks to win friends in the market with his own spin on the company’s turnaround program. We hold QBE Insurance in the Fat Prophets Global Contrarian Fund, the Global Opportunities and Australian Concentrated Share managed account portfolios. Fairfax Media was also on the rise with a 5.2 % gain to $0.71. The stock has now clawed back the losses seen in the wake of the surprise resignation of Domain’s CEO Anthony Catalano. I wrote last week that the reaction was heavily overdone, and that it does not damage the underlying investment fundamentals for either Domain or Fairfax (which has a 60% stake). The market is probably starting to appreciate this, and that digital revenue growth is going to be an important value driver for Domain, and as it plays catch up with bigger rival REA. We hold Domain and Fairfax in the Global Contrarian Fund as well as the Concentrated Australia and Small & Mid-Cap managed account portfolios. Shares of Wynn Macau slid 6.5% in Hong Kong yesterday, while parent company Wynn Resorts saw further weakness in US trading, closing 9.3% lower. The reversal in fortune for the shares follows the reports of alleged sexual misconduct by billionaire founder and CEO of Wynn Resorts, Steve Wynn. The allegations go back decades making Steve Wynn the latest casualty of ‘Harvey-gate’. The Board of Wynn Resorts responded by saying it had held a meeting and it will form a special committee, consisting of independent directors to investigate the allegations. Mr Wynn has firmly denied the allegations. We hold Wynn Resorts in the Global Opportunities & US managed account portfolios and Wynn Macau in the Contrarian Fund and Asian managed account portfolio. Both shares are still up strongly over the past year, mostly due to a rebound in the Macau gaming market and a string of strong financial reports. Wynn Macau generates around 70% of the parent company’s revenue and EBITDA. The allegations are simply that at this stage, and are yet to be proven, but have already had repercussions. Steve Wynn has resigned from his position as finance chairman on the Republican National Committee. The Macau government has also had ‘talks’ with the company about the ‘suitability’ of directors and key employees. The Last Jedi sneaked over the $1.3 billion mark at the worldwide box office over the weekend, ranking it as the 9th biggest grossing movie at the global box office in history (unadjusted for inflation) and the sixth biggest ever in North America. The split is currently approximately $610.7 million in sales domestically and $700 million overseas, even with a soft showing in China. Some have suggested this was a stumble for Lucasfilm parent Walt Disney, but that ignores the shift in Disney’s studio business model in recent years and what was still an impressive overall tally. With Marvel, Pixar, Lucasfilm and historical in-house studios, Disney is no longer reliant on a single ‘tent pole’ movie each year and regularly tops the global box office. This is only going to be further strengthened by its pending acquisition of a suite of 21 Century Fox’s assets should it be approved by regulators. As I have written about in the Daily previously, this will be a transformative deal with significant implications for the entertainment industry. 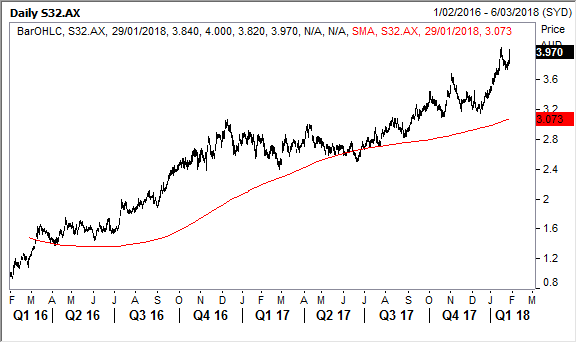 Disclosure: The Fat Prophets Global Contrarian Fund declares a holding in: South32, QBE Insurance, Fairfax Media, Domain, Wynn Macau and Walt Disney. Previous PostPrevious How low can the dollar go?